There are a staggering amount of options when it comes to selecting a soft serve ice cream machine, but one of the most popular is the Taylor 794, an innovative model that gives convenience, reliability, and consistency to your business. 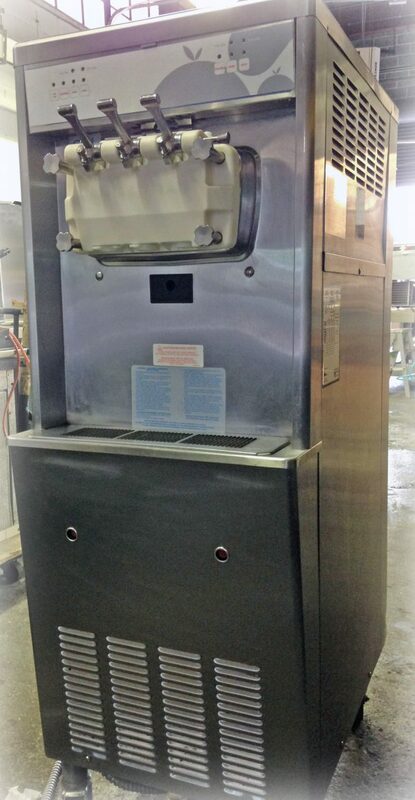 Here is a bit of an In-Depth Look at the Taylor 794 Soft Serve Ice Cream Machine available as the 794-33 and also the 794-27. One of the main reasons that the Taylor 794 is so popular with business owners is its versatility. The soft serve ice cream machine has two freezing cylinders and two mix hoppers, allowing you to offer a combination of flavors or frozen treats in one machine. The chance to use the two hoppers and mixers at your discretion allows you to better meet the demands of your customers in one convenient machine. Having a machine that all of your employees can operate in an efficient manner is crucial, and the Taylor 794 is designed to make service, operation, cleaning, and maintenance simple and clear. The machine uses indicator lights to alert employees when mix needs to be added. It also has Softech microprocessors that provide electronic control of the machine while measuring product viscosity, which helps maintain a quality product. The freezer door on the Taylor 794 is made of a specially-designed thermoplastic that allows for quick ejection. The product moves quickly with a simple move of the handle, and self-closing draw handles are a standard feature, reducing the chance of a mess or wasted product. Made to Fit Your Business – Literally! Despite a wealth of high-quality features and accessories, the Taylor 764 has a narrow profile that allows it to fit comfortably in many different locations. It has a width of roughly 20.5 inches and a depth of about 33.25 inches, making it usable in tighter spaces or serving areas. With a height right around 5 feet, it can easily fit in rooms with even the lowest ceilings. Although it has a compact size, there is plenty of space for product in the Taylor 764. Each freezing cylinder holds 3.2 liters, and the hoppers hold 14 quarts. Even on the busiest of summer days, you should have enough soft serve ice cream product to keep up with demand. If you start to run low, the freeze time is less than eight minutes so simply add mix for continuous operation. To make the Taylor 794 more efficient and cost-effective, the soft serve ice cream machine has a standby feature. This mode, which activates during periods of no use, maintains a safe product temperature throughout the hopper mix and the freezing cylinder without beating the mix. When the dispensing door in not in place, the beater will not operate. This feature enhances safety, as operator cannot activate the beater until the door is put back. Find Your Soft Serve Ice Cream Today! With the Taylor 794, you can have a soft serve ice cream machine that delivers more business and more profits to your company. Whether you choose any of our Used Taylor 794 or any of the fine machines we currently have available, you can be confident that our machines will keep it going strong for years! Previous Previous post: Not Sure if a Soft Serve Ice Cream Machine is Right for your Business?